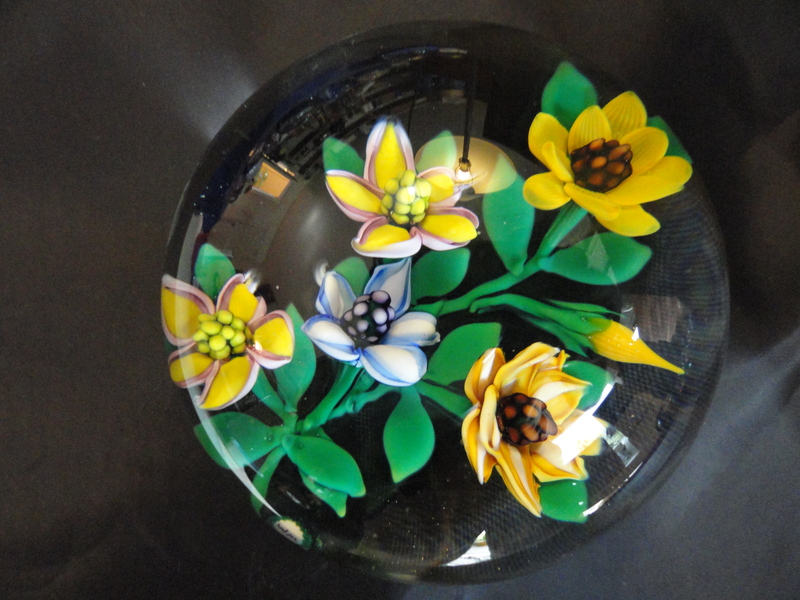 It is very hard to decide just where to start with my paperweight collection. 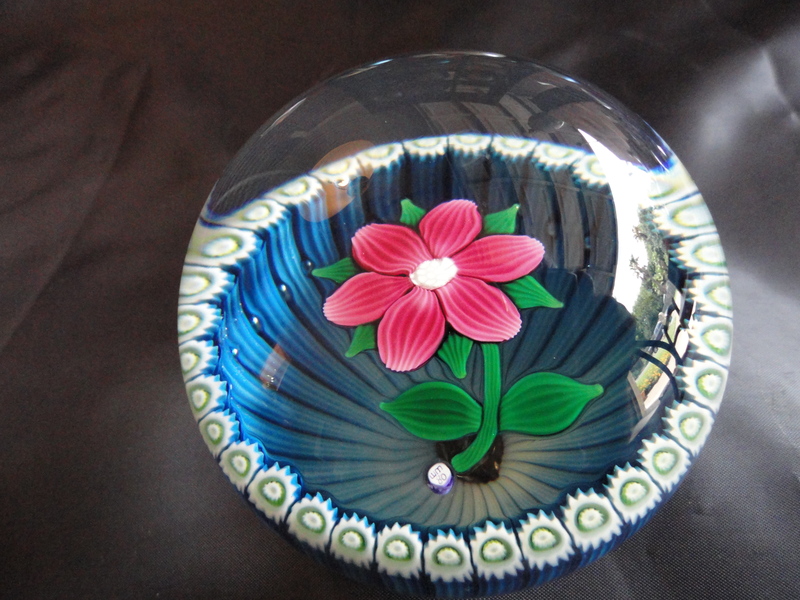 From my last post you can see that there is a plethora of subject matter about collecting paperweights. 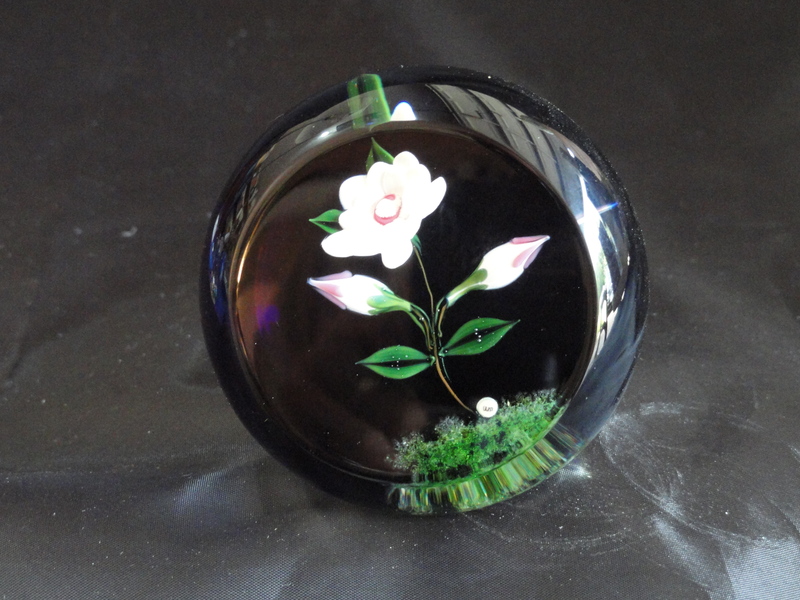 There are as many paperweight makers as there are paperweights it seems but not all maker’s are created equal. 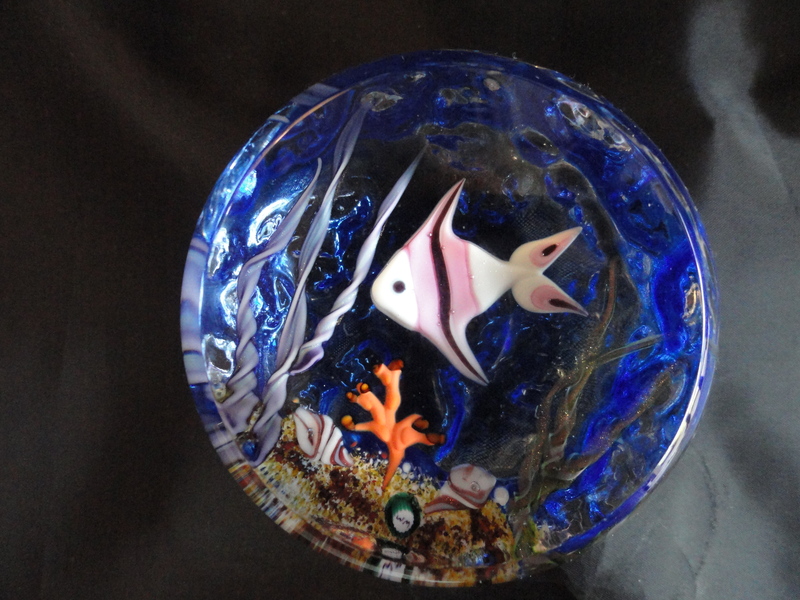 One of my personal favorites is William Manson Sr.
William Manson’s career in glass began in 1966 when he joined the Caithness Glass Co. in England, as an apprentice glass blower. 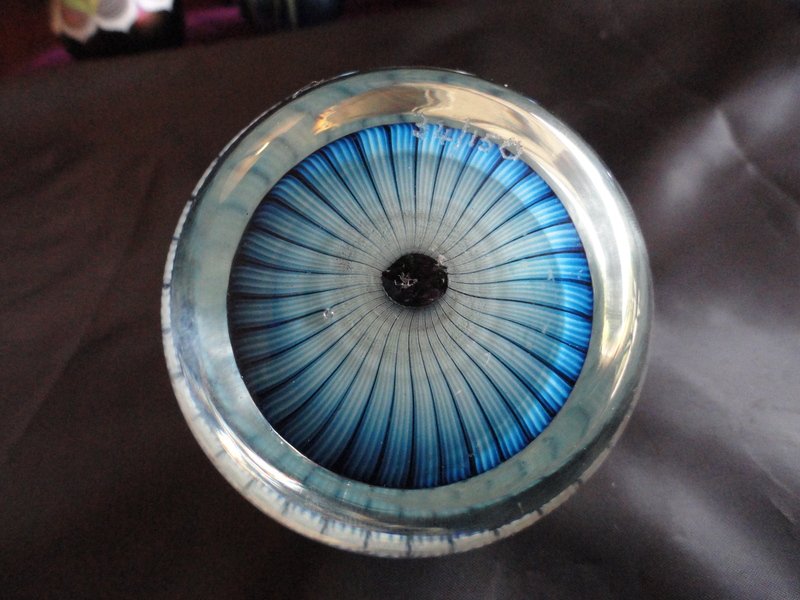 He trained under the watchful eye of a master glass blower, Paul Ysart. 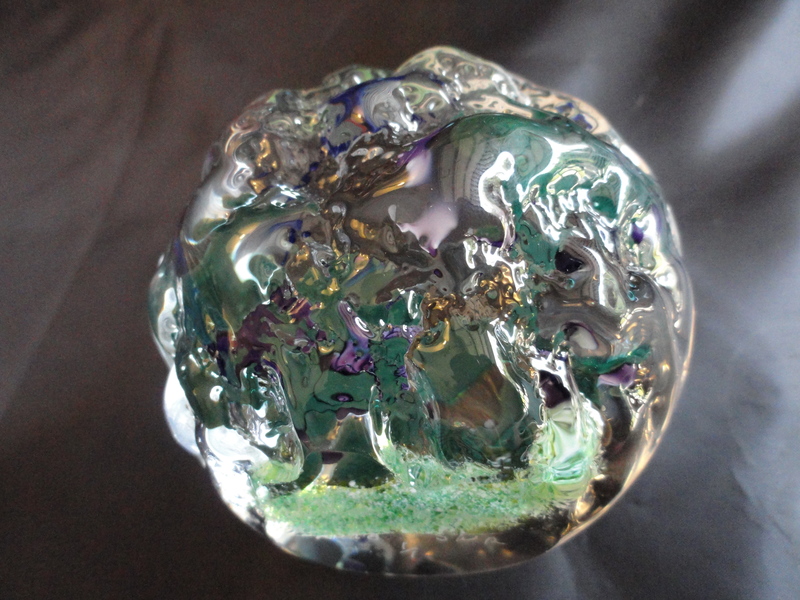 William was introduced to the art of making glass paperweights. 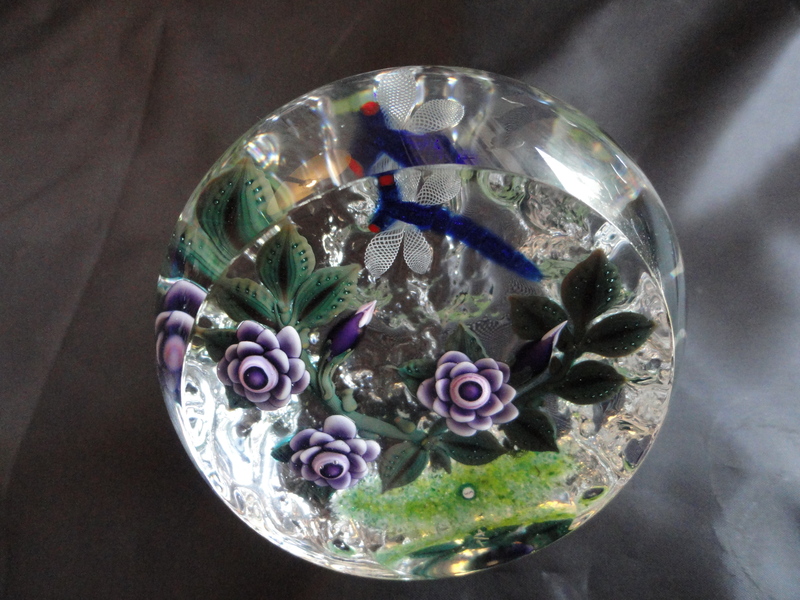 He left the company in 1970 with Ysart and began a journey of intensive training from Ysart for four more years before returning to Caithness in 1974 as the director of their Limited Editions department using many of his own designs and expertise. William has a unique style all his own. 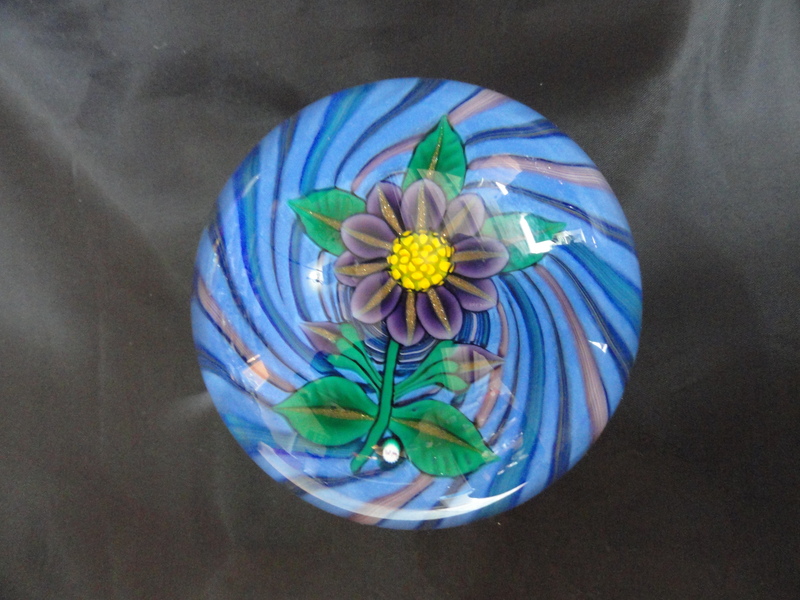 His pieces include lampwork flowers surrounded by garlands of millefiori canes as well as nature weights such as salamanders, fish and swans. 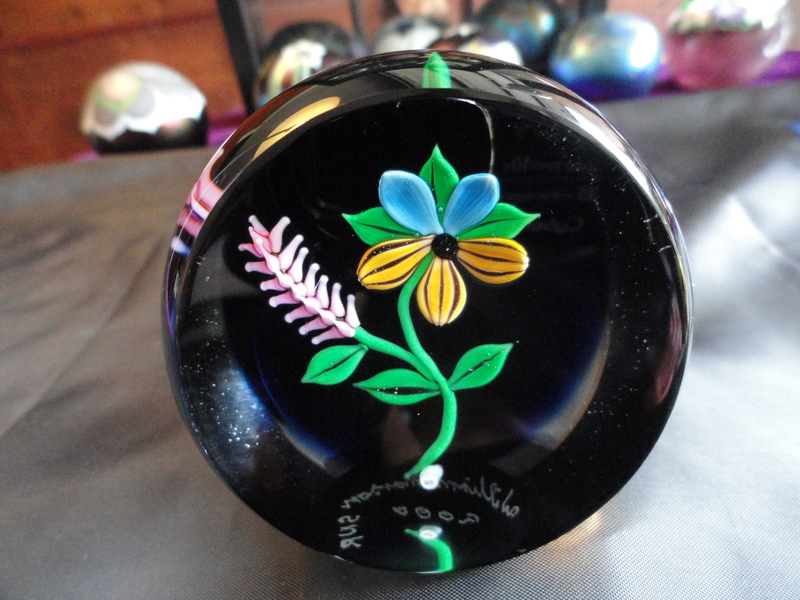 Usually made in Limited Edition sizes of 150 his weights are signed with a WM cane and sometimes dated. 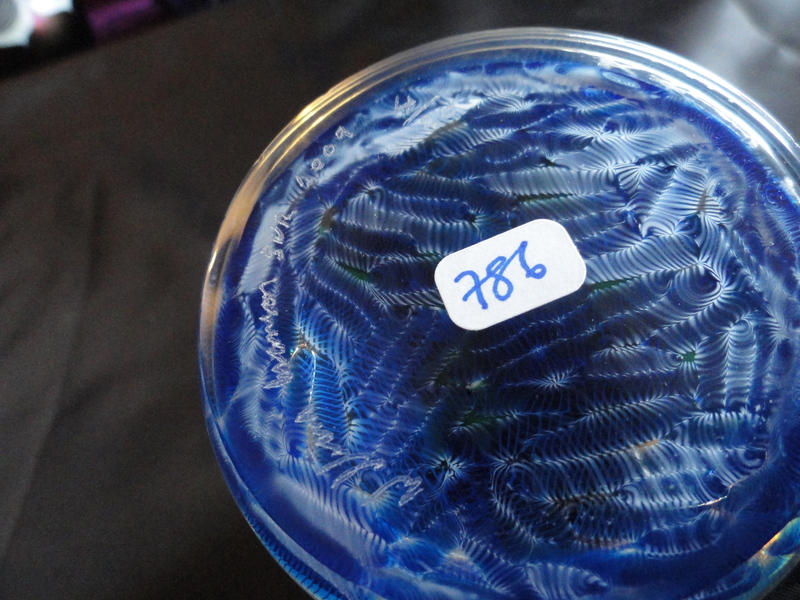 Occasionally you can find pieces personally signed by William. The number of the weight in the LE is usually written on the bottom of the weight. What I like most about his PWs is the glass encasement. The glass is heavy and very clear. Always well polished and faceted. 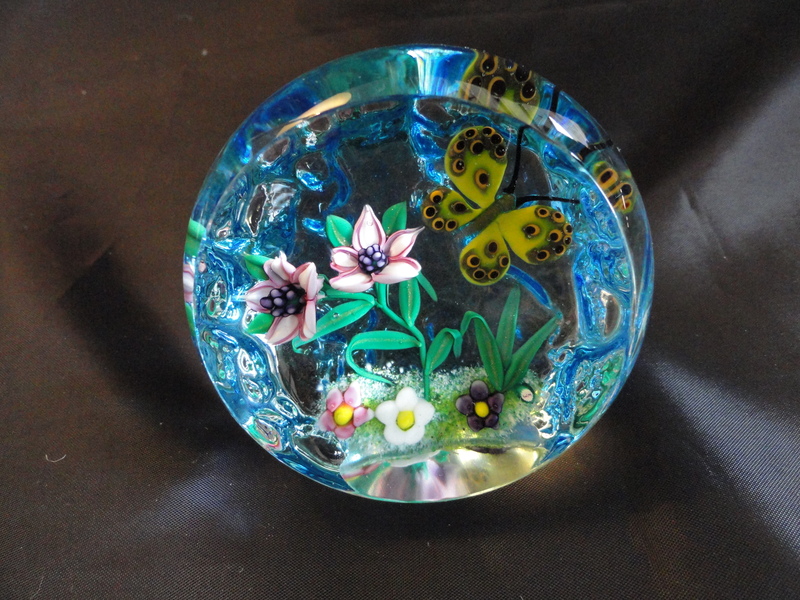 “Pansy Paperweight” made in 2000 and hand signed by William Manson Sr.
A beautiful Manson Sr. weight “Silk Worms” 2009, Limited Edition, 4 of 20. This next PW is an older edition and has excellent color combination. Another plus of Manson weights is his use of color. Manson Sr. “Clematis” PW. WM and date cane “1980”. Limited edition of 150. This one is #34. 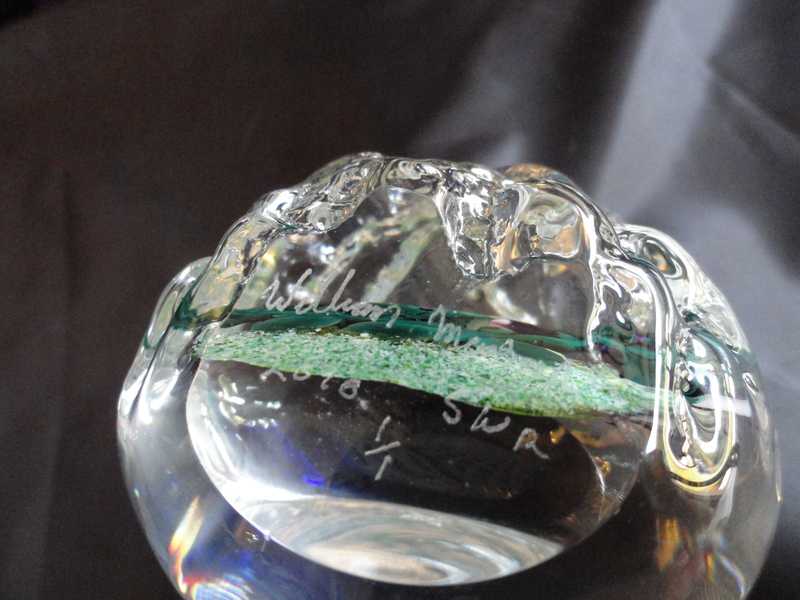 I consider this next weight to be a very special Manson paperweight, made in 2010 it is an edition of 1. Meaning it is the only one made. There are no others like this one. “Three Roses with buds and Blue Dragonfly” an exceptional PW by William, signed on base, edition 1/1 as well as the WM signature cane. You can expect to pay in the four digits for a one of a kind Manson Sr. weight such as this one. If you inspect the wings of the dragonfly closely you will see they are lattacino. 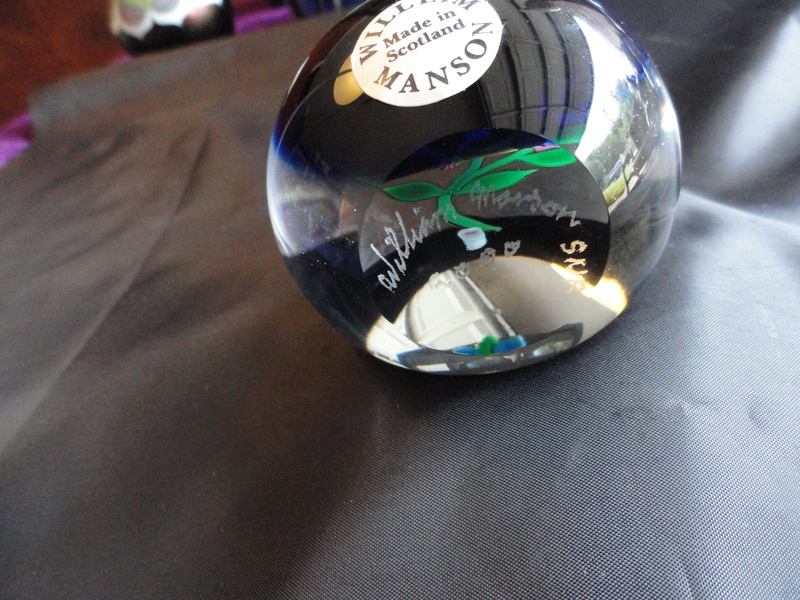 I will continue to purchase William Manson Sr. paperweights to add to my collection. 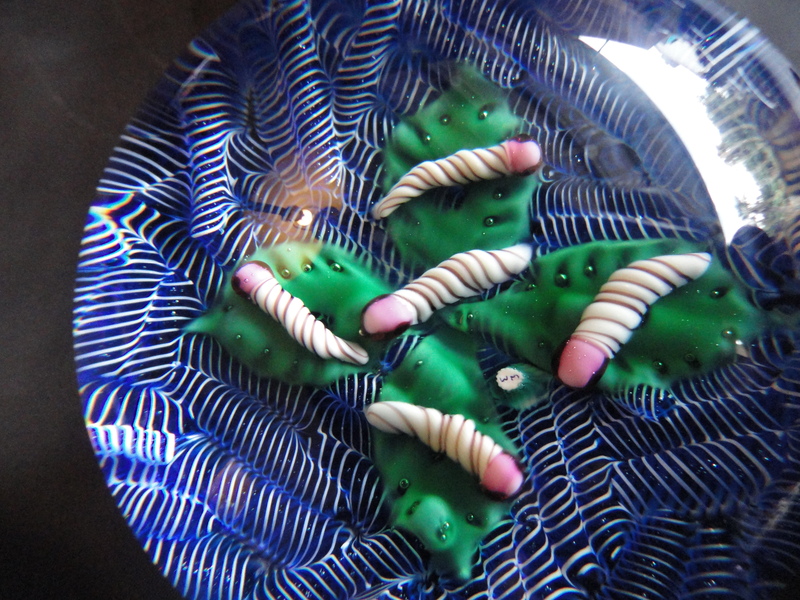 His work reminds me of the old French lampwork weights that sell for 1000’s of dollars a piece. 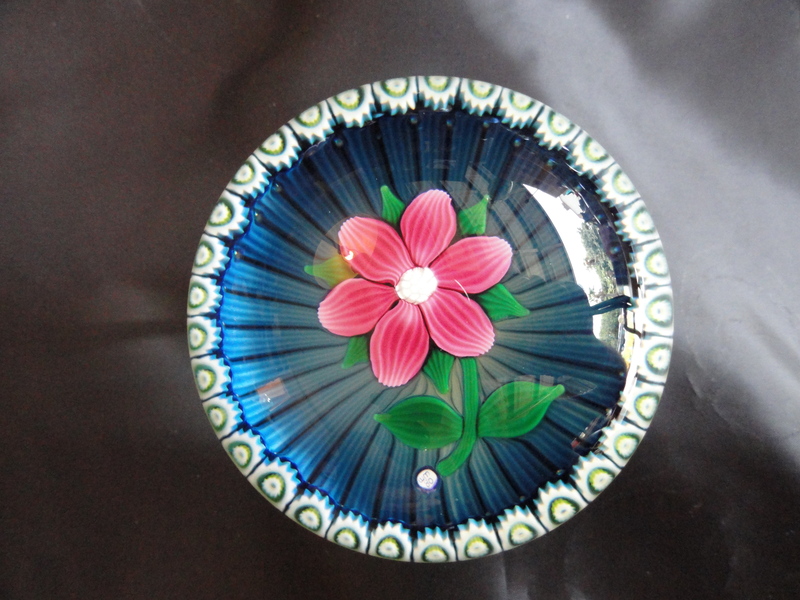 You would be hard pressed to find another English Master glassmaker who’s work is as well done. 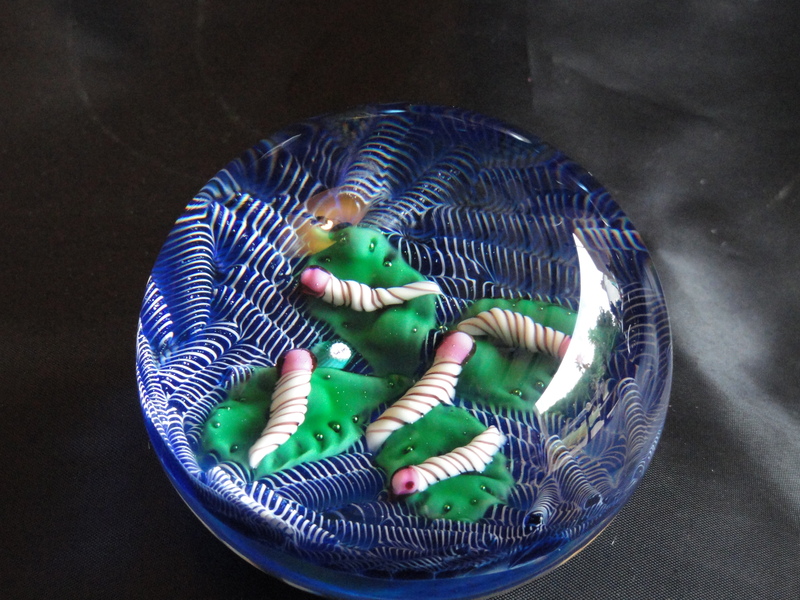 Check out all of my paperweights that I now have for sale at my eBay store “Kelekchens”. Place your cursor on my assistant “the duck” and enter. 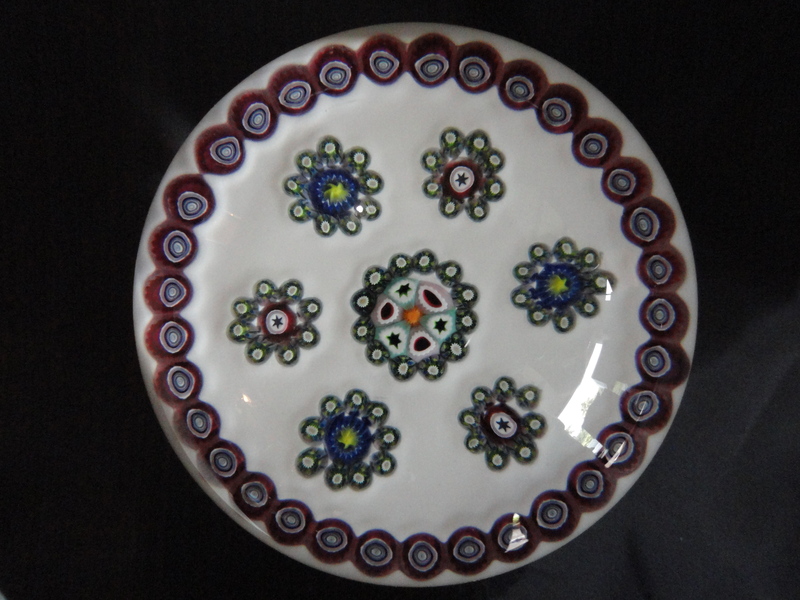 Go to Paperweight Kelekchen or you can contact me through this blog under comments. Thanks for reading my blog. Hi there, I love your manson weights my name is graham scott and i also collect w.m weights. I have a few one offs and 42 altogether just now. If you get a newsletter then it was my fathers ashes in his recent weight the tree of life. I have a few of my weights listed on f/b feel free to have a look there is a ying + yang picture beside my name, Graham Scott. I will also be doing a master class in april with willie. get in touch if you would like to discuss anything or swap pics of weights hope to hear from you regards Graham.